Book Bite Reviews: Back to School Read-A-Thon!! 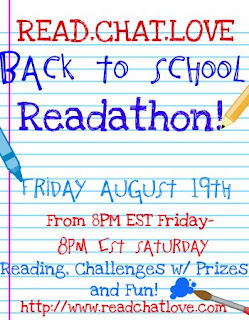 Just wanted to let you all know about a Read-A-Thon that is going on today from 8pm to 8pm tomorrow!! It is hosted by Read. Chat. Love and there will be tons of prizes, challenges and extra surprises along the way. There is still tons of time to sign up, so head on over to the site by clicking on the image above and become a part of all the fun!! I know i can't wait to try and get a bunch of reading done.